Nerei, thanks for your work! Where can I find models that are not in the main game? The first place to start is probably the google spreadsheet I have made documenting the models. Not sure if I have specifically linked to the github repository on it but if not here is the link. Again however note that some of the models on github are beta stage and only got basic grey texturing. Other than that the files that are not included in the game already should all be found in the November 2018 and 2018_02_RC_01/july-ish 2018 files. The files in those two rar archives should only contain completed models. Also these should all be installed chronologically so July 2018 => November 2018 => Github to ensure any file updates are applied properly. I do not quite understand how to install all this into the game? First off remember to make backups of files before modifying them. The graphics folder goes into the [SR root]/graphics folder and the graphics/meshes folder goes into the [SR root]/graphics/meshes folder. The contents of the picnums.txt files is appended to the default.picnums file found in [SR root]/graphics/meshes. This file can be opened by the asset manager or any text editor. What model the game connects to what unit design is controlled by the picnums value in default.unit which is the file defining unit designs. The file is found in [SR root]/maps/data. Picnums is the fourth value from the left. The ID given in the spreadsheet I linked is the same as the picnums ID needed here. E.g. if you want to use the "Akagi" model you change picnums of a unit design to 1536. For these change to actually show up in-game you need to recache. Start the game and select whatever starting date you want to recache. In the scenario settings check force recache option and start the selected sandbox/scenario/campaign. It will hang for some time while the game recaches. Once done recaching the game should start with these changes. I have tried to make a few cold war era European vehicles. Yes I am writing the B1 Centauro under that label despite it entering service around 1991. These still have a long way to go. 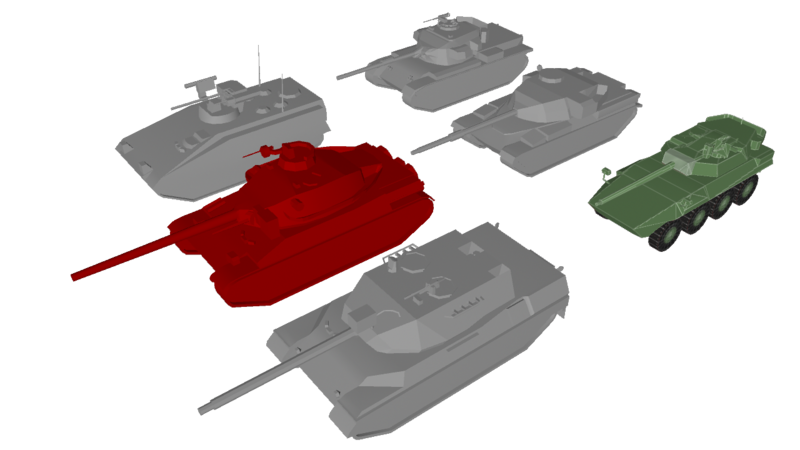 The grey vehicles have not even been properly UV mapped yet and the Chieftain needs details on the turret still. I might also change the Centauro a bit with spaced turret armour etc. Well the Centauro will be useable as a B1 Centauro at least. I have a few other 8 wheeled tank destroyers like the M1128 Stryker MGS or Type 16 MCV so it is not the only option. There is also an incomplete ZTL-11 and I do want to make a few other semi-modern wheeled tank destroyers at some point. 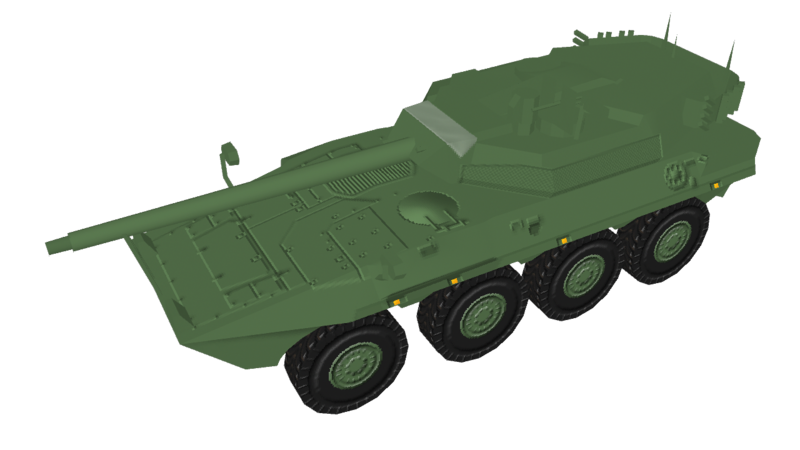 Here is an updated version of the Centauro with a few more details added (both mesh and texture). The main difference is that it now has the additional spaced armour on the turret as well as smoke mortars. Little shading done so far and most on that rendering is done by Maya. In-game the vehicle would mostly just be a green blob. The turret is too far off centre lengthwise to properly revolve so I am simply not going to make it do that. I have added proper locking brackets to it instead to represent the barrel being locked in place for transport.